"Elite Squad (Tropa De Elite)" is an intense and astonishing look at Rio de Janeiro's notorious favelas, the volatile slums on the edge of the city. The film is set in 1997 and presents an intimate look at the city's vast and intricate web of corruption. 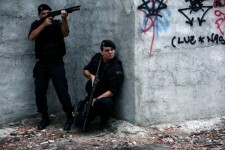 Drug trafficking militias have virtual control within the favelas while the police run their criminal enterprises outside. The elite BOPE force (State Police Special Operations Battalion) combats drug trafficking –keeping order has its price though and their actions make it difficult to distinguish right from wrong and justice from revenge. BOPE Captain Nascimento (Wagner Moura) is facing a crisis: in addition to the pressures of fighting within war zones, the Captain must find and train his own replacement so he can escape the day to day violence and be close to his wife who is about to give birth to their first child. Two of the force's newest recruits, Neto (Caio Junqueira) and Matias (André Ramiro), are childhood friends: one is quick on the trigger to maintain order and the other refuses to compromise his ideals. Together they are the perfect replacement. Alone they may not have what it takes to survive. Directed by José Padilha, ("Bus 174"), and written by Padilha, Academy Award® nominated writer Bráulio Mantovani ("City of God") and Rodrigo Pimentel, comes the controversial film "Elite Squad (Tropa De Elite)." It is based on accounts from Pimentel's 19 years as a military police officer and BOPE Captain.